Since our Spring 2019 Day/Night Photo Shoot on Saturday 9th March 2019, we have received some wonderful feedback from the participating photographers. This has come via email and our social media channels and we are so proud that the efforts of our volunteers, staff and other photographers have been recognised; we thought that it would be good to share those comments. Advanced notifications of any future events will be notified to the people on the mailing list, before they are added to our website or announced on social media. JW: “Just to say a big thank you to everyone today who organised and helped at the photo Shoot. Jacket potato was brill. Brilliant day really enjoyed it, other photographers were so polite and nice. IH: “Just a quick note to thank you for a most enjoyable day and evening at Newark Air Museum on Saturday. A great night shoot, well organised and not too crowded with just the right amount of people and varying times for each aircraft meant not everybody was in the same place at the same time. I hope you and the museum thought it worthwhile doing. It was a 380 mile round trip for me which I did over the two days of the weekend. I'll send you a link to my night pictures when I have them edited. JY: “Just wanted to say a very big thank you to everyone involved in setting up the night shoot. Everything was run very professionally and it was a thoroughly enjoyable event. Will look forward to visiting again and attending more events in the future. PP: “Just to let you know I really enjoyed the event and managed to get some great photographs. It was very well organised. 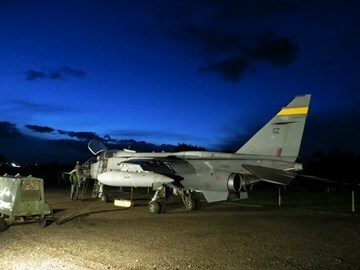 PS: “On 9/3/19 we returned to Newark Air Museum in Nottinghamshire to photograph a selection of their aircraft at night. The event, organised by the Museum itself to... directly boost its funds, was very professionally run and a highly enjoyable afternoon and evening spent in great company. Huge thanks to everyone involved for arranging it and all their hard work during the day. We arrived during the afternoon when there was time to reacquaint ourselves with some of the aircraft, displayed both outside and within the two hangars. We also took the opportunity to climb into the cockpit of their Avro Vulcan, along with a knowledgeable guide, which was a fascinating experience ... how could such a huge aircraft have such a small cockpit for the five aircrew and such limited visibility even for the pilots! JY: "A big thank you to everyone involved in organising the recent night shoot. Great atmosphere and lots of great opportunities for images."